It’s true… A home seller must disclose material facts when selling a home. Unfortumately, not all home sellers think it is a good idea. I often wonder who people think they are trying to protect when we see agents put “No SPDS, No CLUE” in the public or private remarks of our MLS system. It baffles my mind trying to figure out why someone would NOT want to disclose material facts of a transaction to a buyer or potential buyer of a piece of real estate. Hiding defects is a really bad business decision. Full disclosure is a much better way to sell a home. In Arizona, our current residential purchase contract says that the seller of a property will deliver a Seller’s Property Disclosure Statement to the buyer within 3 calendar days of contract acceptance. An Insurance Claims History is to be delivered to the buyer within 5 calendar days of contract acceptance. This same form is also commonly referred to as a C.L.U.E report even though we haven’t used the term in our contract for years. In case you are not familiar with a S.P.D.S or a C.L.U.E report, let’s do a very brief review of what they are. 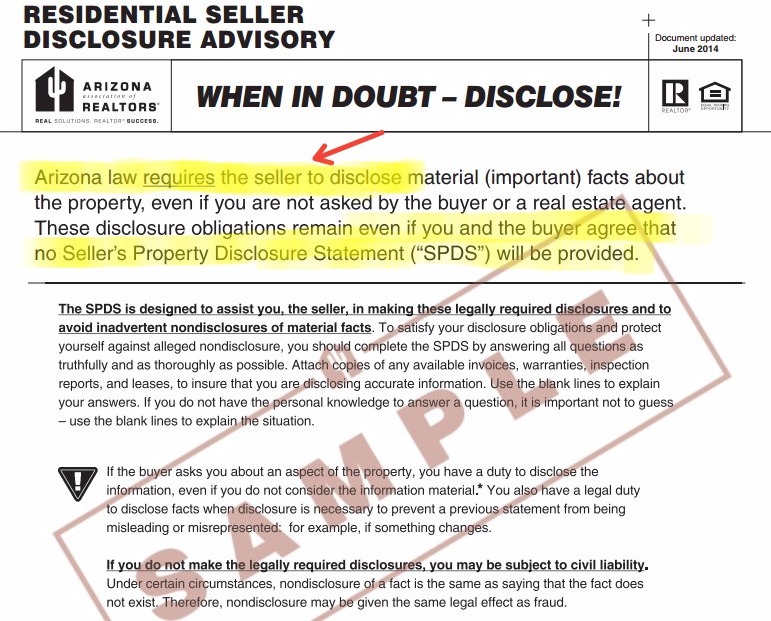 S.P.D.S – Seller’s Property Disclosure Statement. This is a form that our standard Arizona residential real estate purchase contract asks a seller to fill out and deliver to a buyer within 3 days after contract acceptance. C.L.U.E – Comprehensive Loss Underwriting Exchange. Our purchase contract also obligates a seller to provide a written 5 year Insurance Claims History within 5 days of contract acceptance. If the seller has not owned the property for 5 or more years, the obligation is simply to provide a report for the amount of time the property has been owned by the seller. Many banks, investors, short sale sellers or “flippers” of property seem to think they are super-savvy when saying they have NO knowledge of the property, therefore they have nothing to disclose. This is when we often see the “No SPDS / No CLUE” remarks come up. BUT… Many of us believe that just because someone has not lived in a home, does not remove their obligation to disclose material facts. A seller knows who owns the home, right? If they purchased the home or took it back via foreclosre, they know “something” about the property Limited disclosure, in my opinion, is better than no disclosure at all. I love it when a seller has remodeled the home. You know the one: It has new tile, carpet, etc. Why do they not want to disclose that information? Hiding behind non-disclosure as a way to protect against future lawsuits is a misconception that flippers and wanna-be investors have and it could open them up for potential liability. It amazes me that so many agents allow clients to say they can’t or won’t fill out a Seller’s Property Disclosure form. If there is a part of the SPDS that the client doesn’t know, they can say that they do not know the answer. Instructing or allowing a seller to say they have no information concerning the date purchased, ownership of the property, utility providers, work they have completed or any other material fact of the home seems like they could be leaving themselves open for future legal trouble. Wait… What? Since the fire?!? This is a home that looks to have new flooring, paint, fans, fixtures and more, and the owner doesn’t want to tell a buyer the type of work that has been done to the property after a FIRE? Really?!? So, just for fun we might want to think about it this way… Mr. Non-disclosure fails to tell the buyer of a known defect of a property, and he and Joe Buyer end up in mediation or in court trying to come to an agreement. When asked to produce receipts for the tens of thousands of dollars in work that was done to the home, Mr. Non-disclosure wants people to believe he had no knowledge of what was done? Oh, oh kaaayy. That will go over just fine. Yes, it is unlawful for a seller to refuse to disclose material facts about the property. The cover sheet for the Disclosure Statement clearly spells it out for us. Below is an article by Michelle Lind when she was head legal council for the Arizona Association of REALTORS. It is good reading for anyone who might think that non-disclosure in real estate is a good idea. The article was written in 2000, and a more recent opinion about why Disclosure matters was written in January of this year by the super-smart Scott Drucker. Mr. Drucker is the current General Counsel for the Arizona Association of REALTORS. Seller Property Disclosure Statement: Seller shall deliver the SPDS to the Buyer within five (5) days after acceptance of the Contract. Thus, pursuant to the Contract, the seller is required to provide a SPDS in every transaction. Some sellers are reluctant to provide a SPDS. However, where a seller of real property knows of facts materially affecting the value of the property that are not readily observable and are not known to the buyer, the seller is under a duty to disclose those facts to the buyer. Hill v. Jones, 151 Ariz. 81, 725 P.2d 1115 (App. 1986). Additionally, pursuant to the Contract, the seller is obligated to disclose all known material latent defects that materially and adversely affect the consideration to be paid by the buyer. The SPDS will evidence the fact that the seller has made these required disclosures. Additionally, most sellers know whether the property is in a homeowner’s association (“HOA”) and whether there are HOA fees. Arizona law mandates seller disclosure of these and other HOA issues in HOAs with less than 50 units. The seller may also be aware of assessments, litigation, or liens affecting the property. Most of the questions on the SPDS ask only for information of which the seller is aware. However, if there are questions on the SPDS for which the seller does not know the answers, the seller can simply use the explanation lines to explain. The fact that certain information is unknown by the seller, and why, can be important to the buyer. Despite the foregoing, some sellers still refuse to provide a SPDS. If a listing states that a SPDS is not available, or will not be provided, a buyer’s broker should nonetheless advise the buyer to request the SPDS in the offer. The seller can respond to the offer requesting a SPDS with a counter-offer that a SPDS will not be provided. However, before the buyer accepts the counter-offer indicating that a SPDS will not be provided, a buyer’s broker should provide the buyer with a blank copy of the SPDS form, which will enable the buyer to make an informed decision regarding whether to waive the SPDS. In these circumstances, a buyer’s broker would be wise to obtain the buyer’s written acknowledgment of receipt of the blank form. A buyer should never waive a SPDS without seeing the SPDS form. Even a blank SPDS is valuable to the buyer. The buyer can and should utilize a blank SPDS as a checklist in conducting the desired inspections and investigations. The SPDS can prompt questions that will assist the buyer in evaluating the property. Clearly, the SPDS is a valuable tool for both buyers and sellers in a real property transaction. Therefore, every buyer should receive a SPDS. Of course, it is always a good idea for a home purchaser to do their own due-diligence when buying any piece of real estate. For help and guidance through the buying or selling of real estate, you should always consult with your favorite real estate agent.